My wife and I took a weekend off. That is, we left behind the usual weekend chores and household tasks and just did stuff we wanted to do. It was nice. Good to take a break every now and then and not get so stuck in your routine that there’s no joy in life. We came home with a number of new toys for our music room. 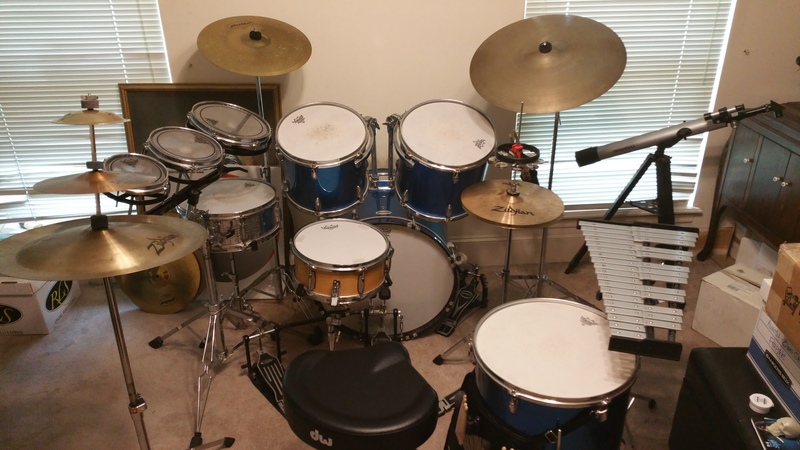 My drum set, which started out as a battered “free if you’ll come get it” starter grade kit, has now evolved into a fairly pro-grade system, with a variety of distinct and unusual voices. I am not a drummer. In fact, before the wife found this set on the Facebook marketplace, I’d only briefly entertained the idea of getting a virtual set to use for adding background sound to productions. Once in hand, though, I did what I typically do with new things. I embarked on a voracious quest for information on tools, techniques, and methods to make some use of the thing. Don’t get me wrong. I am not now, and likely will not ever be a performer. I am a producer, in that same sense that Alan Parsons was a producer on Dark Side of The Moon. I do have some facility for taking pieces of music, sound, etc. and arranging them together into a cohesive whole appropriate to accompany the visual project I am working on. So by most definitions I’m not a musician or a drummer, even if I do manage to create the snippets of rhythm and riff that I meld into the whole. In my “beginner” state I’d never dream of taking on that title, but then a couple years ago I was less than confident about using the terms photographer and filmmaker to describe myself. And that got me to thinking about the nature of such titles. For some years I was hesitant to merge the digital tools I had mastered in things like Photoshop with the traditional media of paint and graphite. My mind somehow thought that augmenting a painting or drawing digitally was somehow “cheating”, and that if I couldn’t get the drawing the way I wanted “by hand” then I just wasn’t good enough. But eventually I realized that I was also doing the digital augmentation “by hand” – that it was my skill set and my knowledge that made it possible for me to realize my final vision using a tool that I had mastered, and there was nothing wrong with that. The evolution of new tools and new methods should always be embraced by the creative artist, or at the very least, evaluated and explored. Eons ago our remote ancestors ground up rocks and charred bones and smeared them on cave walls with animal fat and tree sap. We don’t typically do that now, and yet no one decries egg tempera or encaustic or oil paint as “violating” our status as artists. To use a photographic reference instead of a live model is now considered quite acceptable, and while shooting film does provide a number of advantages over digital (as well as disadvantages), the creatives are driving technology ever forward in an attempt to gain those advantages, and to build something totally new at the same time. In the world of music we’ve come from sticks and stones to digital synthesizers, sampling, and even AI driven rhythms. There’s noise about that traditional instruments like guitars and drums are dying out as new technology takes over. But every movement forward is always, always, an attempt to create an intensely personal and unique vision. The tools serve that work, period. Anyone who sees it otherwise needs to look back on their path and see where they stepped off. Deep breath, and start again.